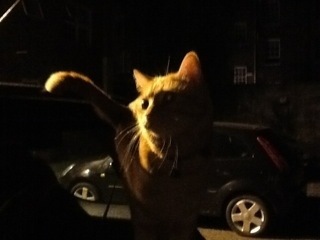 I have just watched a master class in feline assertion. The very cuddly and vocal Manx cat next door whose owner wants him to be an indoor cat was in our garden. Mr Manx is not on the same page as his owner and is making himself known in various gardens. I didn’t see him at first. I chanced to look out of the window and saw Hartley and his brother Smudge, side by side in identical postures; crouched, focused, silent; watching, I thought, potential prey just out of my sight behind the bike shed. Being afloat is probably not MasterB’s favourite thing, but he copes pretty well and he knows he will receive lots of attention. Whether he remembers the first occasion he came to das Boot I rather doubt. It was 29th April 2011, the day of the Royal Wedding, and two days after MasterB had lost the means to father kittens. I wrote about here, but had the usual problem posting pix when at the marina. I had better luck a day later as you can see here. Since then he has been aboard many times; got over the shock of realising he is surrounded by water; growled at people passing on the path; yowled at members of the feral colony who have climbed aboard; taken a keen interest in the birds and insects flying by; accepted reluctantly that any shoreleave has to be in that thing of shame – the harness. He has also been photographed often. Only when Cat died did I realise how few photos I had of him. that is not a mistake I am making with MasterB. Here are a few from the weekend. All show him on das Boot. There are a couple I think are definitely calendar worthy. What do you reckon? MasterB has relocated to the garden. I am listening for warcries. None so far. Thank goodness. So now for some pictures of flowers. I didn’t think I’d post anything tonight. But MasterB having just, with my help, seen off the mainly black cat who thinks our garden would be a nice territory, is keen to stay outside a bit longer to be master of his demesne. It has been a long week. I have a new boss. She seems nice enough, but inconsistent. As she wants us to get on with things ourselves – a bit if a challenge this as we were micromanaged to death under the previous boss – then gets uppity when she thinks she should know something we haven’t told her. Maybe she’ll settle down. I do hope so. It’s all a bit disorientating. I got told off because I am not attending a meeting on a day I am working elsewhere. Not having mastered being in two places at once, I seemed doomed to lose. I also seem to be spending far too much time considering the whys and wherefores of others’ behaviours instead of doing my job. Also, new boss hasn’t answered a question I have now asked her twice, and it is becoming pressing. What is sauce for the goose etc. Not that I want my old boss back. No way. She was a complete nightmare, a control freak with knobs on. I am not sure what the knobs were, I wouldn’t like to twiddle them; we would probably be in a nuclear holocaust. She has been in twice this week. I do wonder if the new boss’ need to assert herself is anything to do with the old boss who tried to nail things down in perpetuity before she left, and apparently spent some time during her visits this week energetically trying to coerce the new boss to follow her plans. Thank goodness I am part time there. It was probably inevitable that much of the chat was about cats. We are all cat owners, or at least owned by cats, and one of us has a new kitten. The new kitten, though absent, got a lot of attention. She is a pedigree, a Russian Blue, chosen for non-shedding qualities, and from the photos, very beautiful. MasterB’s visits to Wanda’s garden are not going down well with Rosie. She believes that Wanda, and everything associated with her, is hers. So she keeps appaering on top of the wall to glare after a MasterB who is already on his next escapade. I had a hint about what had kept MasterB the other side of the wall the other day. 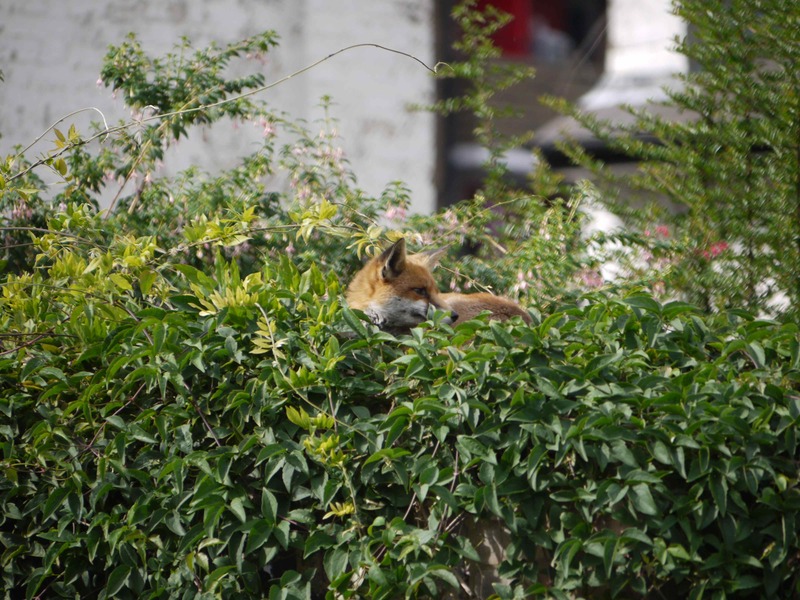 He was happily playing in the garden when the fox appeared. He has been chasing foxes all summer, is normally keen to rush after them, but this time, he flattened his ears, scuttled towards the gate and cast anxious looks over his shoulder. This was originally posted on MyT. The Cat and I left London mid-morning and had a quiet journey. It would have been earlier except Cat, correctly guessing a car journey was on the cards, decided on evasion, and it was only be pretending complete indifference that I lured him close enough to me to catch. He threw up a hundred yards short of the marina, which made for a slightly stressful arrival. But once on board, he’s been a star. Now that people are returning to their boats with the promise of spring, we’ve had social calls, rather than professionals checking out the loo/batteries/fridge etc. 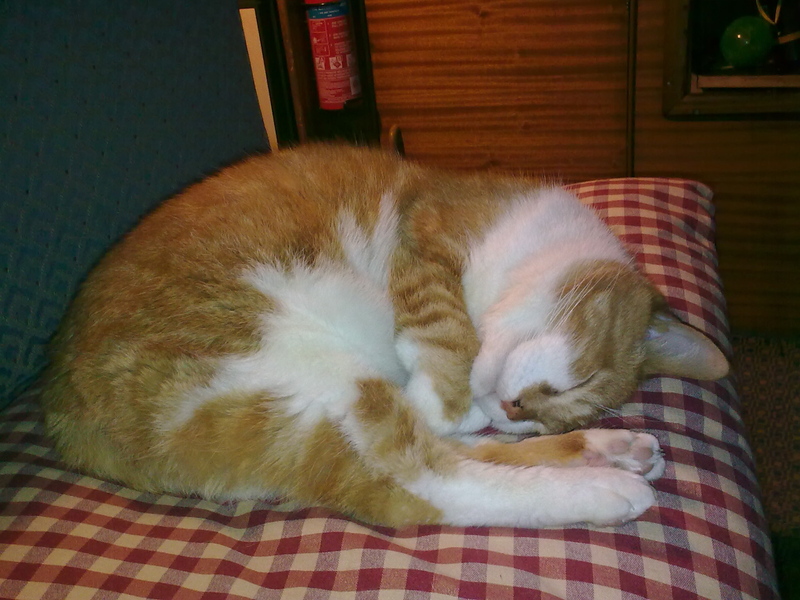 Cat has purred and welcomed, then stretched out over three-quarters of the seating and slept. Last night he woke me with fearful howls. I leapt out of bed, convinced he was in dreadful pain, to find him defending das Boot from an uninvited visitor, one of the feral cats from the colony at the nearby farm. I hope he doesn’t do it again tonight, but I can’t help thinking this means he’s decided this is his boat and he’s happy here. Cat may be in his sixteenth, or even possibly seventeenth, year, but he can still put on a good show. I’ve just watched him intimidate neighbour’s cat, real name unknown, but called Gussie in this household because of an indefinable something that brings P G Wodehouse’s Gussie Fink-Nottle to mind. Gussie used to beaten up daily by Cat. Sometimes it was twice a day. So, wisely, he took the precaution of never entering our garden if he saw Cat in it. But recently he seems to have realised that Cat’s abilities to defend his territory are not as fearsome as formerly, and he is routinely visiting and openly strolling around the place. Today he was already in the garden when Cat went outside to patrol his domain. He walked towards Cat in a confident sort of way and then found himself being chased across the garden by an outraged ginger and white cat whose tail had fluffed up alarmingly. At the foot of the wall, which Cat can no longer climb, they stopped. Cat fired off some comments which you didn’t have to be a fluent feline speaker to understand contained threats and, very possibly, bad language. Gussie started that very slow pavane that cats do when they want to retreat in the way least likely to provoke further aggression, trying to get onto the wall without actually turning his back on Cat. It took several minutes. Cat gradually relaxed, but couldn’t resist some parting shots once Gussie was on the wall. Presumably something on the lines of ‘good riddance to bad rubbish’. Then he began his inspection of the flowerbeds and anointing of the plants. There was a distinct swagger about his walk. As a display of bloody-minded determination and successful bluff I don’t think it could be bettered.